Safavieh Lighting Cydney Pendant - White - 18.5" x 18.5" x 32-104"
Safavieh Lighting Wynne Pendant - Gold - 12" x 12" x 34-106"
Created to honor the lighting vessels in New York s top decorative arts museum, this 3 light adjustable pendant lamp is a work of art. Brilliant strands of grey beads bring crucial color to the contemporary home while its tassel creates instant luxury . 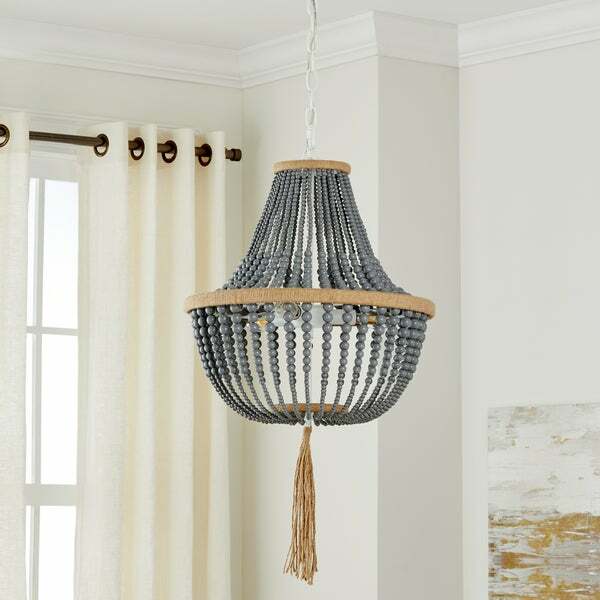 Dimensions 16.5" x 16.5" x 29.75" - 111.75"
I ordered this lamp and the Safavieh Lighting 18-Inch Adjustable Beaded 3-Light Angie Grey Pendant Lamp to hang in our great room. The lamps are so beautiful. The quality is excellent. The tassel that comes with it is strange and wont hang correctly, so we removed it on both of them. I did a lot of research on which color, material, etc I wanted to buy. I then spent the same amount of time searching for the best price and quality. This was the best place for the price and quality. It looks exactly like it does in the picture and in the description . I absolutely love it and would buy again in a heartbeat. Quick shipping and easy checkout .. it was a great experience and product. 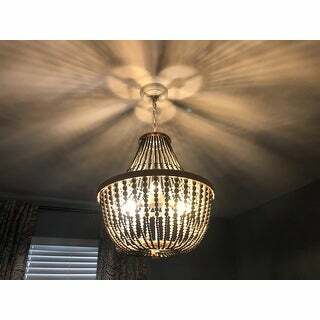 I am absolutely in love with this light fixture! It completely transformed my dining room. The quality is good and the assembly instructions were pretty decent. I cannot say it was easy, since it's pretty heavy, but still, I was able to assemble it and put up myself without any help. Would definitely recommend it. P.S. I saw in the posted reviews a comment about a tassel not hanging properly. The trick is you have to soak it in water, squeeze the water excess out and hang it. It will dry out nice and straight. I absolutely love this light! 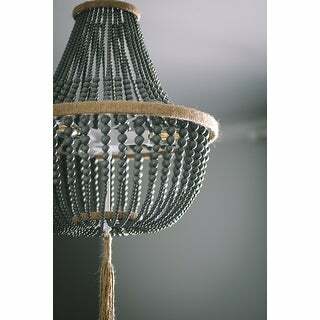 Especially love the gray beads with the beige wrapped cording and tassel. I installed the light n my master bathroom above the free standing tub. One of my favorite lights in my new home! This light is beautiful! it added that extra touch we needed to the outdoor patio space. This is a high quality fixture worth the money spent. The color is as pictured online. It comes already put together all you have to do is put it up and add a light bulb. Love the look of this light fixture. Bought it for a nursery. Wet the tassel so that it will straighten out, and it is perfect. The light shining through the beads creates a pattern on the walls. This is pretty but not a look I want at all times. Need other sources of light in the room. Gorgeous light! Highly recommend! Looks way more expensive than it is! Hung this in our foyer and it completely transformed the space! Highly recommend this for price alone! This light fixture is beautiful. The beads are a perfect grey. A couple people mentioned the tassel being curly or not straight. I just steamed it with an iron and it’s perfect. 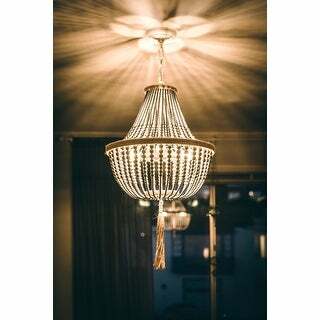 In love with this lighting fixture! We installed the light above our garden tub and it looks amazing. Way prettier in person! Love this light. It is perfect for my daughters bedroom. It's ok. Cute, but the tassel was cheap so I threw it away. To me it's more for a teenager/girls room. For that it's perfect or a very casual room. Classic grey beads with raffia type trim. I was expecting this fixture to be bigger but I still love it. The detail is really nice. I do wish they made it in a bigger size. I love the bohemian vibe. 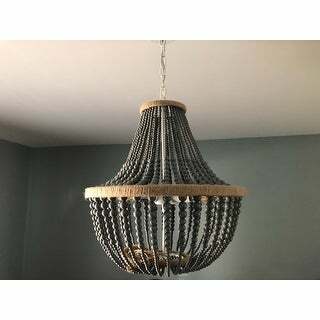 "Is the light fixture chain adjustable? I need it shorter!" 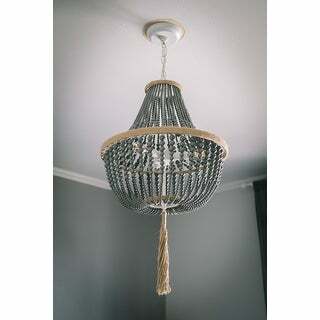 Yes the chain can be adjusted to have light hang at 29.75" or as low as 111.75"
"How tall is this light without the tassel? How long is the tassel?" This item needs to be hardwired so it may be possible to make it dimmable, but we do recommend consulting a professional for the installation. "How long is the whole fixture?" I have looked for the item everywhere. After countless hours online and in stores Overstock has the best price and exactly what I wanted. "How long is the fixture without the tassel?" "What kind of lightbulbs are used? And how bright are they?" This product comes with C26 bulbs included, and has an E12 screw terminal. The maximum wattage for this light fixture is 40W. Safavieh Lighting Davin Flush Mount - Black - 14" x 14" x 20"
Safavieh Lighting Adra Pendant - Grey - 18.5" x 18.5" x 32-104"